Here are some places to check out on the web followed by some commentary. Placing the pictures in this blog is not allowed as the photos are copy written but just highlight and search and it will take you to some very photos. I left the comments on the photos here for you to read. Today, this structure serves as the Lamar Ranger Station, which provides housing for the Lamar ranger and emergency visitor services. Built near the turn of the century, it is on the National Register of Historic Places. 5)The photo below, taken in late September 1988 shows the fires smouldering in the Lamar. The valley shows no signs of the great fires today, but Specimen Ridge in the background will for a half century or more. The fires of 1988 smouldering in the Lamar; The photo was taken at Rose Creek. The following have pictures and terms about cottonwoods as a blaze. Very beautiful. 7)The Cariboo Region in central British Columbia is ablaze with yellow cottonwoods in fall. Wish you could see pictures on this page. It is worth seeing. Top are three browns and the Rangers sometimes refer to the Valley as Brown Valley do to the large number of bears in the area. That makes four Browns. But do any of these Browns lead us anywhere? How about Brown trout? No. That would be any area from here to Alaska. No help at all really. How about a brown building? Too many brown buildings in the mountains to be useful. How about brown trout and brown buildings? No help yet? A clue to last over a hundred years something historical something that narrows down the search. How about Ranger Gary A. Brown? His home was in YNP that’s a good clue. What else about Ranger Brown? He was the assistant head director of the Yellowstone Nation Parks. Oh, Fenn spent the best summers there in YNP. Ranger Brown started a museum is Fenn into museums? Yes, check out the Will Bill Cody Center in Cody just outside Yellowstone and not too far from Lamar Valley. Any other Browns? How about Arthur Brown he painted the watercolor of Mammoth Hot Springs. It was appraised in Billings Montana not far from Yellowstone. The painting itself has a very interesting history it may be fun to look it up if you’re a history buff. The story even has some railroad history. Years writing, a legacy at hand plus one maybe two million dollars in the mix would Fenn just be writing junk? How about the blaze is it the sun? No help. Is it a sign on a tree? This would be very helpful, but first where in the Rockys do we look. Is it a wise person who finds the blaze or is it by study we find the blaze? To keep from being left out of the chase I hope it is through study. Any historical blaze around? The 1988 Blaze in Yellowstone change the U.S. Forest Dept’s policies on Forest fires. That’s historical. It also came close to burning down Silver and Cooke City in the NE corner of YNP just missing the Roosevelt Hotel. The fire started just north of Gary Brown’s home and it crossed the Lamar river just down from Brown’s old home. How about the wolf who lived there named Big Blaze oh and don’t forget Little Blaze. The Lamar Valley wolf pack has lots of followers. Check out Blaze the wolf in Yellowstone it is very cool. He is no longer with us and that is sad. Ok, you decide, have you heard of better clues? Why not share them. Is there anyone as redundant? I keep finding clues that shout Yellowstone, Lamar Valley and Lamar Ranger Station. If there were something that backs this up it is the lack of info about these clues. No one is talking about these clues maybe because they are keeping the good ones to themselves. I don’t blame them but I believe they are too late. If you do find the treasure couldn’t you just take a picture on a dated news paper for the rest of us. It would have saved me a lot of money on travel etc.. After all I love to chase things that I have some chance of catching. Fenn knows but he ain’t talking. Maybe my interpretation of his poem is much better than his. 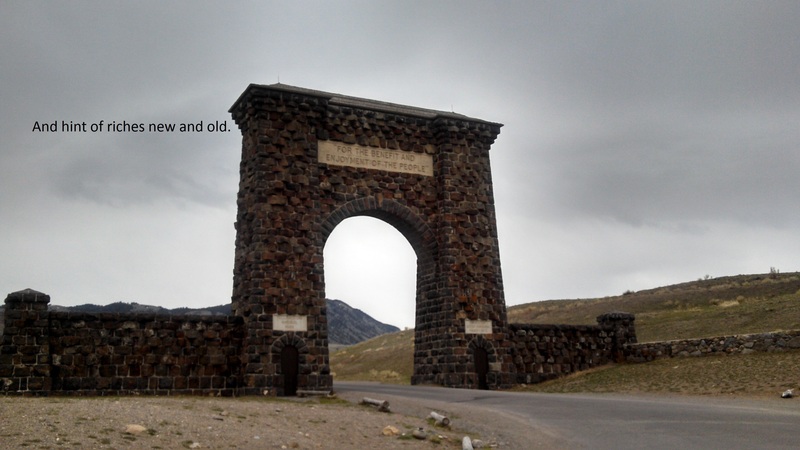 Start at the northeast gate of the Yellowstone National Park (YNP). Any gate will do but from the gate get to US 212. US 212 runs a long the north part of YNP in a east west direction. From the northeast gate go past Soda Butte down the canyon to the Lamar Ranger Research Station and stop at the small turn-out on the south side of US 212 about a half mile from the station. For others coming from a different gate get the free YNP map and find the Lamar Ranger Research Station on Us 212. Park at the turn-out and being careful of the animals (read the rules about maintaining distances to the different animals) walk towards the grove of cottonwoods to the south and slightly east of the turn-out. Walking sticks come in handy as you cross water twice. I never got my shoes wet. When you arrive at the trees look west to the tree in the middle it splits into two trunks. Look at the bottom and find the hollow. Ok time to get real or go home. Two weeks and two trips in that time I know I’m close but no cigar as they say. Then I remembered what Fenn wrote about the person who will find his treasure. To paraphrase he will analyze the poem over and over then go with confidence to get the chest. Last chance I say to myself as I was going back to the car. After this, just the long drive home through Montana then Wyoming, Denver Colorado and finally passing by Sante Fe. Just, just, just oh, just water high and heavy loads, just the long drive home just not the place to be looking. Now like my athletic days it is game face time, confidence in my interpretation of the poem and with one mindedness, Its make or break it a last chance effort. This in mind I head for the starting point, Soda Butte. Here at Gary Brown’s old home I watch as a man about my own age makes and consumes a sandwich. I think here is a treasure hunter eyeing the valley a mirror image of myself but he was leaving and I would soon be asking if that satisfied look on his face as he consumed lunch was in response to Fenn’s suggestion to take a sandwich and a flash light. I noted his Montana license plate before concentrating on the poem and following the exact directions. Put in below, simple go down the road and put in below. Ok, no matter what, I am putting in at the first turn out period, no guessing just trust in the poem. Then there on the left it sat asking me what took you so long. I parked and looking to the valley I see a blaze of cottonwoods separated by a large number of buffaloes and a couple of small cold side runs of the river I knew my quest was soon to end. Walking was easy and crossing the small side creeks just took a hop to get across. The only thing that could stop me now, a bear or two. The trees in the area have little bark from the clawing of bears and elk horns. How could a blaze in the tree last with these over size vandals dissecting man’s intended historical symbols such as UU or FF or a long legged frog. Stay with the poem get to the blaze avoid the herd and watch for bears. Easy, too easy I find it hard to believe its right in front of me. The fifteen hundred feet went quickly as I kept looking for the place reported to have had groups pass by just five hundred feet from those trees. Then I remembered a group leaving from a bigger turn out another half mile from the one where I had put in at. They had stopped at the river crossing at about that same distance. Did they come back after they heard they were so close or was the man at the ranger station having a victory lunch? Before I finished my thoughts I was at the cottonwoods. I tried to fight off the feeling I had been there before but I knew what was next. It was too easy how could it have taken so long to find. The snow kept it covered till spring when anyone could see the blaze, the hole at the bottom of the tree. Now I hear Fenn saying look quickly down. I found the blaze, look down, down to the last tree, down to that blaze in that tree. Heart beating quickly my mind telling me its gone you know that its gone. But I can’t know that I have never been here still inside that dreamy sense instantly insuring me it is gone. Still drawn like a magnet pulls iron my feet knowing where to go I watch as they take me to the tree. There it is and nothing else exist even time is stop. One day on my friend’s clam in Idaho city as I studied the few gold flakes in my pan hunched over and squatting in the creek a black nose toughed mine startled, I looked up to see Jim and his Labrador retriever. Jim was laughing he barely got his message out but his point struck home ” your lucky he isn’t a bear.” Bears, Wolves or angry lions had better get out of the way as nothing could stop me from meeting my fate. This was not a few flakes of gold this was the end of the chase. Inside the tree the hollow was about a foot and a half lower than the ground and at the bottom in the peat was a perfect mold of a box less than 10 by 10 inches and about 3 inches deep. It was so perfect nothing in nature could leave such a print. I couldn’t resist moving my hand through the sawdust. It was cool and dry and fell apart easily. I though a picture should be taken moments too late and I tried to remake the box shape back to what I first saw but it was impossible. This print had taken time to form and now like the treasure its gone forever. 42 pounds inside of a small chest is something like a woman’s high heel the pressure on the ground bellow would be intense making as it did quite a dent add to that a couple of years to set and you would have a unique print. Some will say it wasn’t there to begin with, others will think it fits the poem and Fenn’s life so well it must have been there. Only two people can be sure, Fenn and the finder. I have presented this for your own discernment. I can’t get Fenn to answer so it will remain my own mystery. 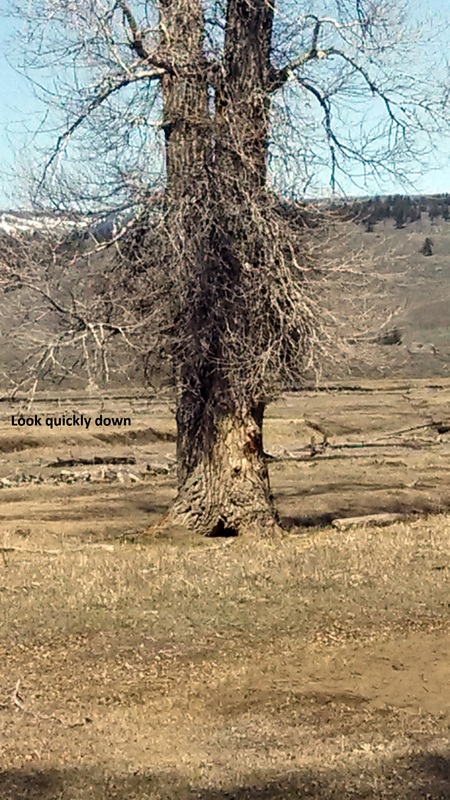 Captpappy’s empty tree mystery. Second place but first to disclose. For those nay sayers enjoy the chase that’s what is most important, as for me let me know if you want a partner to chase the next treasure. My friend and writer asked me to leave this blog up until KUNM’s auction has ended but it will soon go away. Till then enjoy and thanks to everyone who visited, it is great fun to see people from around the world come to read what Capt. Pappy had to say. Do you want CaptPappy’s Treasure map? If so, here ya go: map to the treasure. Good luck if you bid on the KUNM Auction to fund raise for our local public radio. Author captpappyPosted on May 25, 2013 June 3, 2013 Categories UncategorizedTags Arts, Formats, National Public Radio, Public broadcasting, Public Radio, RadioLeave a comment on Do you want CaptPappy’s Treasure map?